If you liked this show, you should follow UK US PSYCHIC TAG TEAM. 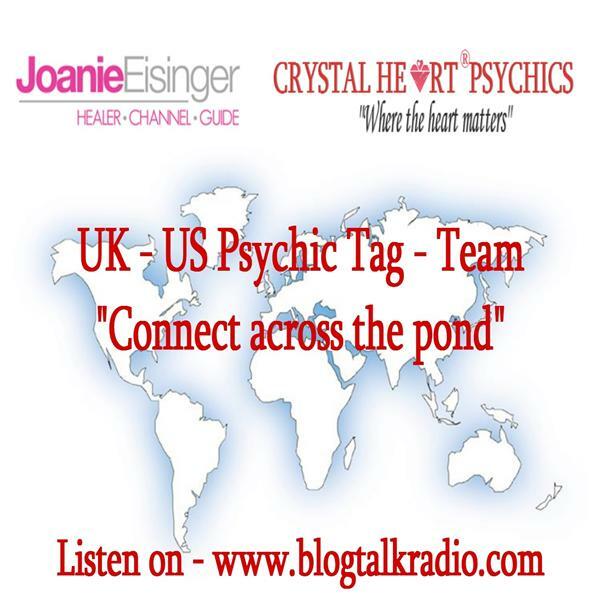 Joanie Eisinger of Joanie’s White Light Healing and Caroline Dixon, Founder of Crystal Heart Psychics join forces to offer friendly, inspirational, warm and enormously valuable psychic readings and healings to assist souls on their life’s journey. Their respective styles magically blend here to create a very unique, entertaining and often humorous and poignant experience for the recipients of their work. Caroline is a psychic medium, Reiki master and healer, NLP practitioner, hypnotherapist and past life regression therapist. Caroline enjoys providing psychic readings and offering healing on any aspect of your life, whether that be relationships, career, spirituality and family. Joanie is a healer and a psychic, former clinical social worker and Gestalt therapist. She employs her gifts for those who wish a greater sense of well-being. Many seek her guidance on a myriad of issues, including finances, health, relationships, spirituality, career and family. Joanie is the recipient of Natural Awakenings Magazine's coveted 2013 Natural Choice Award recognizing her as Favorite Energy Healer in North Central, New Jersey. The content of this show is for entertainment purposes only. The Information provided during the show is NOT intended to be construed as a medical diagnosis or treatment. The information provided should not take the place of a consultation with a qualified physician or health care professional for medical diagnosis and/or treatment.